That content is available openly and for free to all users (learners and creators) of the platform (unless it is hosted in the closed VLE sections of the site, where other criteria may apply). That the site provides space for users to publish, reuse and repurpose content and comprehensive guidance on how to do this. That content published on OLW should be released under a Creative Commons licence. That the site should promote and share good open pedagogical practices to support users creating OER and learners using OER as a service to users. The site provides free OER hosting facilities for those who don’t have access to an appropriate VLE for their courses, so is ideal for experimenting with ideas and creating courses across institutions or organisations. Users can create open courses on OpenLearn Works which can include textual content, images, embedded or linked video and quizzes using core Moodle. The platform has tools for collaboration when creating a draft course (editing, curating and contextualizing materials). There are tools for learners to collaborate with each other when studying a live course such as blogs, forums, interactive glossaries and polls. The platform supports Open Badging which are Mozilla compatible and mirrors the facility on OpenLearn for issuing badges automatically via course completion criteria. 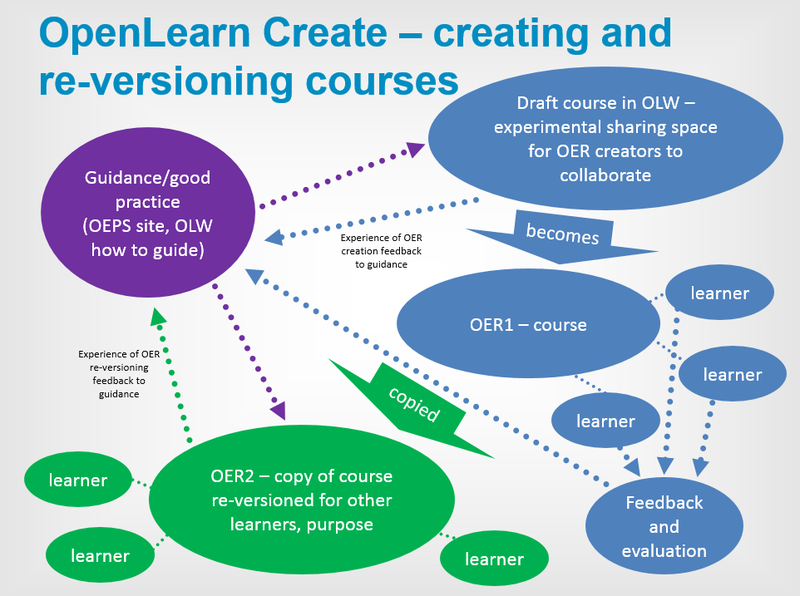 We are seeking views on the proposed developments for OpenLearn Create at the #oepsforum3 and welcome comments on this blog post about the platform. I am pleased to announce that a draft of the project’s course on open educational practices (OEP) is now available for review! In a nutshell the course aims to explore and foreground OEP in part through practical advice on the use of open educational practices (OER) whilst simultaneously highlighting examples of best practice and ideas for your own context. The course has been developed to cover the fundamentals but also provides additional material for further exploration in the Further Reading sections. For the next three weeks (until 26 November 2015) you have the opportunity to feedback on the course and let us know whether it meets your needs, those of your institution and if not, what can be improved. We’d love to hear your thoughts! The badged four-part course will be openly licensed, available on OpenLearn Works and will launch in January 2016. Quite simply in order to make the course better and more relevant for YOU and your colleagues. Previous experiences of this type of open peer review have been incredibly useful: receiving a certain amount of community feedback was essential for the first iteration of the OER Hub’s Open Research course to go ahead. Being open about the course’s development (e.g. regularly blogging about the course’s development) was also important and reflected the Hub’s own open practices. We had excellent feedback from fellow facilitators and interested parties both via this channel and elsewhere which really helped to tighten up the course structure, content and delivery mechanisms. Reviewing the course could just involve browsing the content quickly or a more detailed read… there’s no obligation to read everything! We’re interested in all types of feedback; from general impressions on what’s covered through to suggestions for additional content and corrections. Does this course look useful and relevant to your and your colleagues? Would you use the course material? If not, why not? Is material covered in sufficient detail? Is there something missing you’d like the course to cover? We welcome comments on this blog post, comments directly on the material (click on the header links below to go to the relevant Google doc) or even just a vote on our poll (although ideally we’d love to know why too!). I will be monitoring feedback and responding periodically during the three week review period. So what’s in the course and how is it structured? Each section of the course has an accompanying reading list to enable a ‘deeper dive’ into material and each section also has an accompanying activity. These are still work in progress so haven’t been included; however, you can see a sample reading list at the end of the Course introduction and Part One document. We are also in the process of picking out good examples of best practice to include in the final version. All the content is available below on Google docs and you can comment directly on the material. Or if you would prefer, please comment in response this blog post. 1.1 What do we mean by “open”? 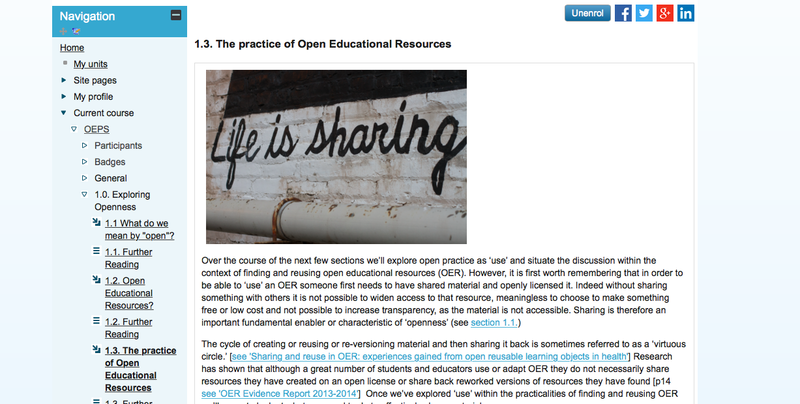 2.1 Why open educational resources (OER)? 2.2 Where can I find OER? 3.3 Why openly license my own material? 3.4 What do I need to consider when creating an OER? 4.1 What license should I choose? 4.2 How can I share my resources with others? What isn’t included in his draft of the course? As above, please note that best practice examples, some further reading sections and activities for each section are pending. Looking forward to hearing from you and thanks for your anticipated input!